I wonder why it is that I find slight mismatching so pleasurable. I like design arrangements that are not quite symmetrical; pairs of chairs in different colours or patterns; the combination of geometry and florals in traditional Indonesian batik designs, and, of course, slightly mismatched socks. I've been admiring this Nancy Bush pattern (yes, Nancy Bush yet again) for some time. 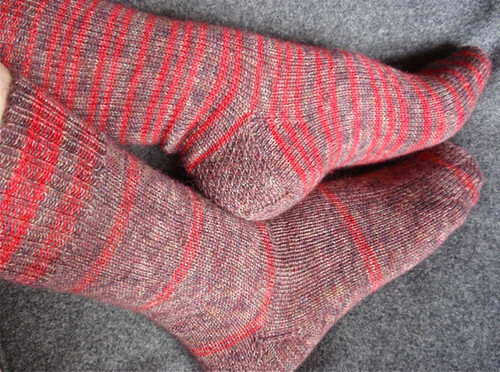 It's called Hiiumaa and is essentially a pair of plain socks. Their only point of distinction is that each is striped differently. 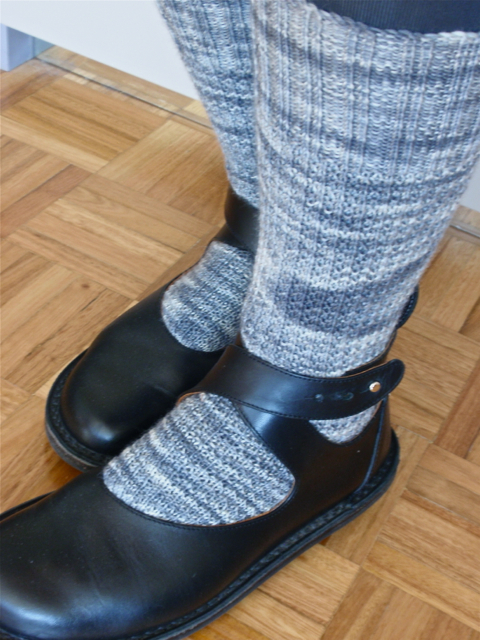 Even though they're plain, the socks have some of my favourite elements - an eye-of-partridge patterned heel and what Nancy Bush calls a round toe. All very satisfactory. Earlier this year I bought two skeins of ONline Supersock 100 yarn from CR&K Daisy Designs at their annual knitting gathering in Wollongong. It's a strong, everyday kind of sock yarn, and the two skeins I bought matched well. Actually, they were probably designed to match well. One is a tweedy red and the other tweedy browny-beige with highlights of the same red. 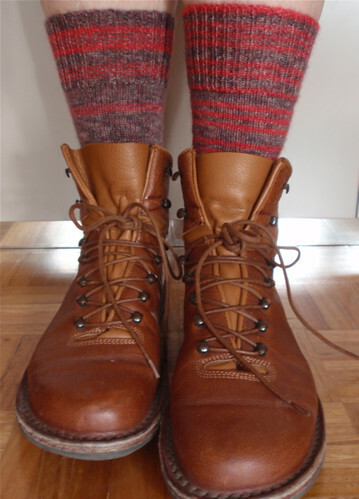 When I bought the yarn I immediately thought it would be perfect for the Hiiumaa socks. And it is. Finally...I seem to have developed a tradition of photographing each of my knitted socks wearing shoes that I think complement them. This time, the shoes don't exactly show off the socks, but I think the photograph depicts what is likely to be the most frequent pairing of socks and shoes in my daily life. Often, when friends or acquaintances discover that I've finally left paid employment (I'm still avoiding the ageist 'R' word) they ask me whether I have plans for this phase of my life. I'm never sure just how to answer this question because for me the greatest pleasure of no longer going to work is that I don't have to make any plans. I'm enjoying the lack of structure. Of course I have to plan to shop for groceries or catch up with friends or visit family, but there are days when I can just make it up as I go along. There's also space in my life that enables me to respond to a last minute invitation from a friend to join a group from the Asian Arts Society of Australia (TAASA)who were visiting the Sydney Biennale exhibition at the Art Gallery of NSW specifically to look at some of the work by Asian artists. It was a wonderful couple of hours. With the guidance of curator Dr Lim Chye Hong we looked only at four works and had time to examine them in detail, discuss them and tease out meanings and relationships. Chye observed that many of the works in the current Biennale clearly were marked by the hand. So many modern works of art are highly conceptual, and often involve film, video and digital elements. But all the works we examined on this visit were highly crafted by hand. I'm always particularly interested in art works that incorporate traditional crafts, or where the technical skill of the artist is evident. 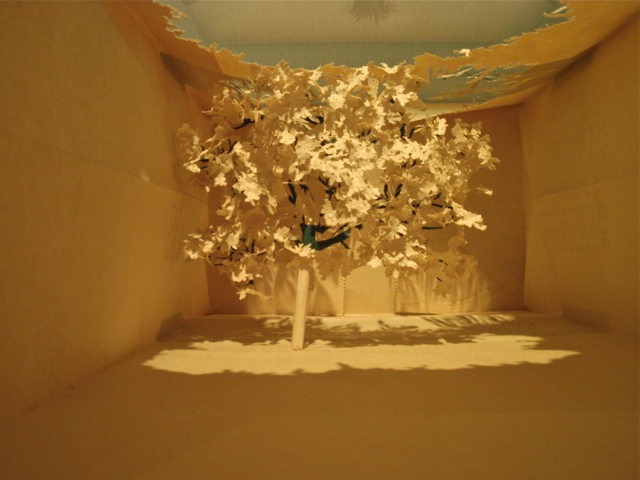 I also love works that use paper and its textural qualities, so a room filled with paper shopping bags of various sizes and provenances where Japanese artist Yuken Teruya had carefully cut and torn shapes from one side of the bag to create miniature trees within the bags, was a magical experience. Even more surprising was a work by very young inner Mongolian artist. At first sight (and indeed, second and third sight) Gao Rong had recreated, in full-scale, loving detail, the cramped but ordered interior of her grandmother's home. This was interesting and moving. But when we eventually discovered that the whole structure was created in fabric, with embroidered detail, the work became extraordinary. 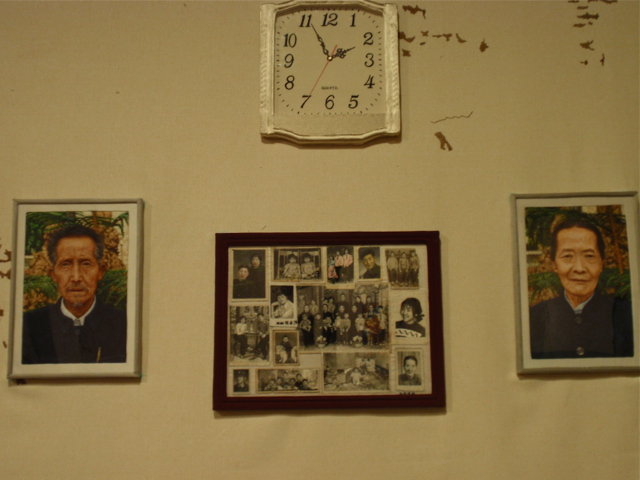 The mould and cracks on the walls, the weathered and worn surface of the chests, the floral patterning on the ubiquitous thermoses, the clock and the photographs on the wall - all were embroidered. 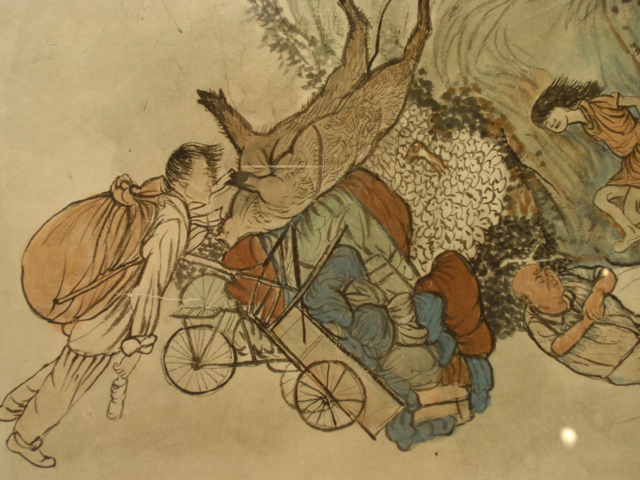 I was moved by a more traditional work by Yun-Fei Ji - two long horizontal scrolls that depicted the uprooting of agricultural and village life to create the Three Gorge Dam on the Yangtze River. What was remarkable with this work was the use of traditional painting techniques to depict, with great subtlety and layers of meaning, a modern phenomenon. I was particularly interested in this work as next month I'm travelling to China and will spend several days on a boat trip on the Yangtze to the area depicted in this work. Chye raised interesting ideas in discussing the politics of this work. The Dam is often depicted as an environmental disaster that displaced millions of people. Undoubtedly this is so. But Chye reminded us that China has a long history of damming rivers and generally intervening with nature to either suit the will of its rulers or accommodate its people. I'm looking forward to my trip in the Yangtze. 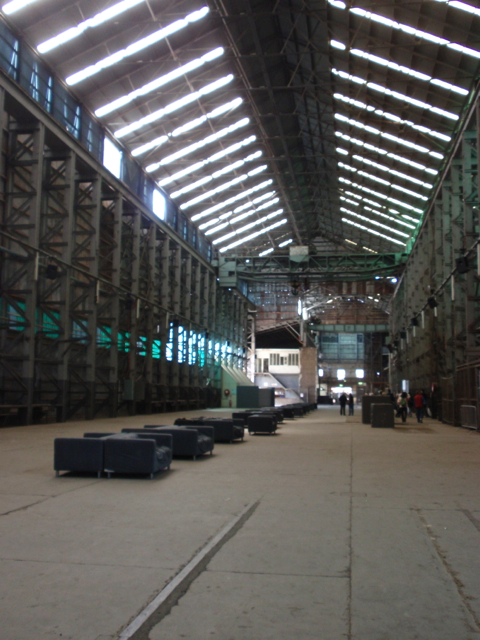 This experience finally persuaded me to visit Cockatoo Island, where many larger art works had been installed for the Biennale. Friends had been urging me to visit, the Biennale is closing this weekend, and Spring weather and the freedom of my days made a visit irresistible. 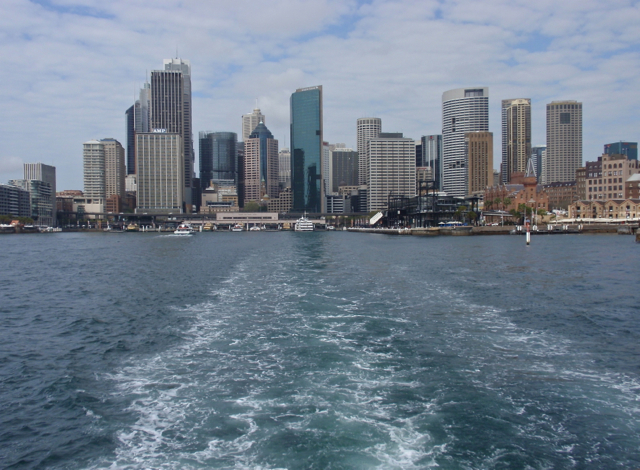 Anyway, what's not to like about an excursion that begins and ends with a ferry trip on Sydney Harbour? Cockatoo Island is fascinating even without the Biennale. The Biennale is icing on the cake. 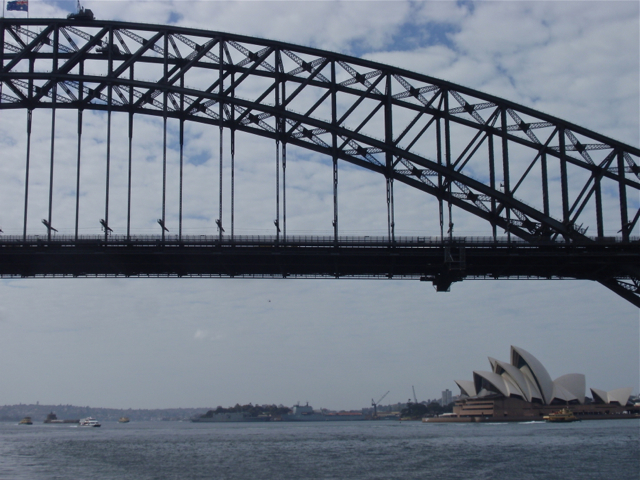 For those who don't know it, the Island is situated in the inner reaches of Sydney Harbour. After white settlement it was initially used as a prison in the first part of the nineteenth century, when convicts were forced to build barracks and a chapel that still remain. Then for more than a century it was used as a shipbuilding site and so is still littered with the vast industrial structures and spaces of that time. The echoing spaces are perfect locations for many of the larger artworks of the Biennale, such as Cal Lane's lacy work constructed from a shipping container and surrounded by sand stencilled into lacy shapes. I was reminded of Chye's comments at the AGNSW that so many of the Biennale's works are 'marked by the hand'. 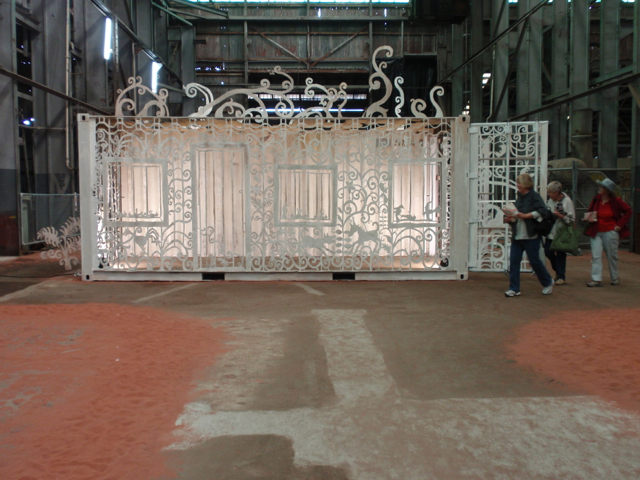 This huge metal construction in an industrial space had memories and associations of hand-made fabrics - of doilies, tablecloths and wallpaper. 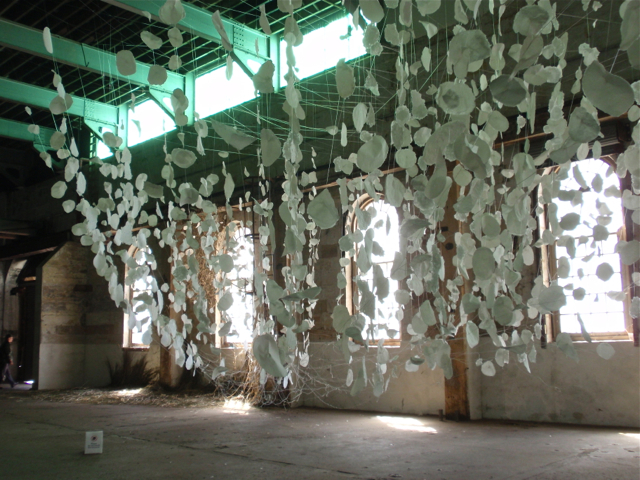 Inevitably, my favourite works were those made of paper or textiles. I looked for ages at Monika Grzymala's work 'The River', created in collaboration with the Euraba Artists and Papermakers, where rushes and twigs gradually transform to filaments of thread and leaves of paper. 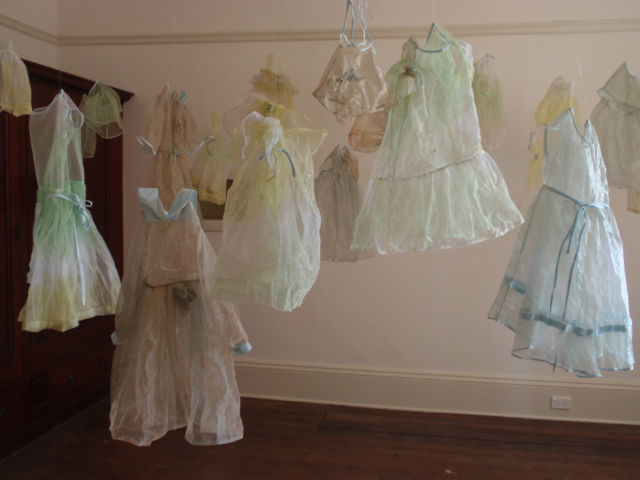 This collection of painstakingly made, translucent silk dresses was hung in a room that had been one of the bedrooms of a supervisor's house on the Island. Both the dresses and the location were nostalgic with inevitable longings for times past and unknown histories. When I see this collection of small girls' dresses it also provokes thoughts of unborn girl children as a consequence of China's one-child policy. 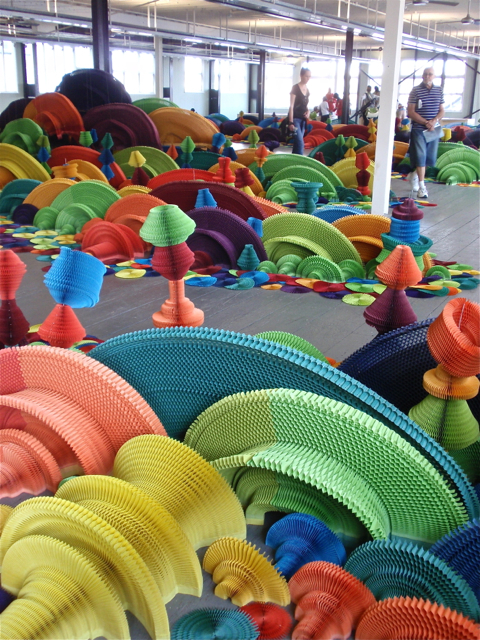 Li Hongbo's 'Ocean of Flowers' drew gasps of delight as you entered a big room filled with flowers constructed from pleated and folded brightly coloured paper. But even here there was a dark side. 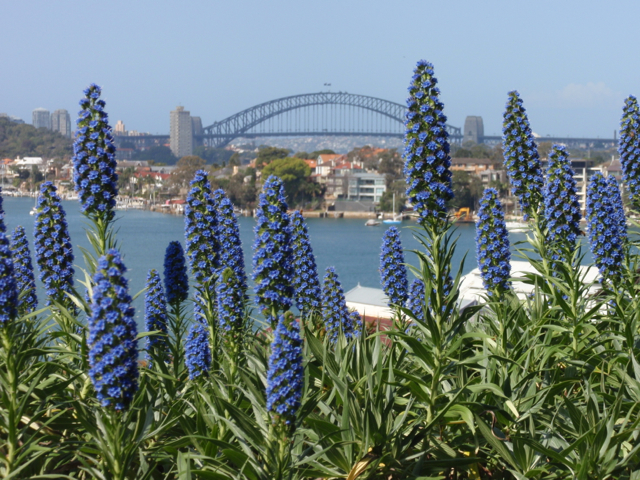 When you looked closely the 'flowers' formed themselves into shapes reminiscent of cannons and guns - muzzles pointed in all directions. Such a great excursion. Such a great way to spend one of my many free days. I have so many photographs. 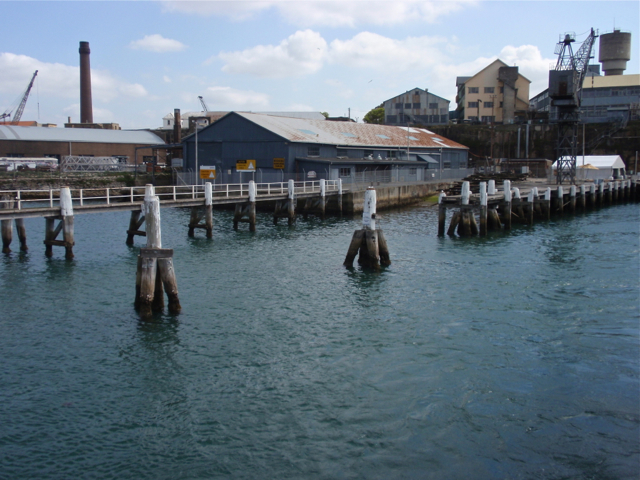 No gallery, however beautiful, could match Cockatoo Island as a location for artworks. 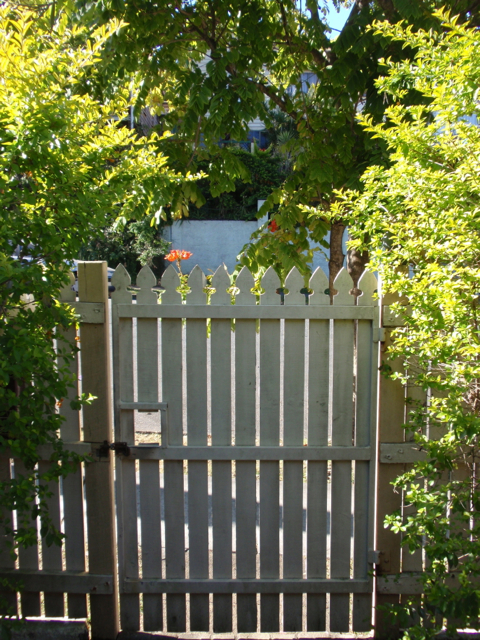 Like so many of the works, the Island itself is 'marked by the hand' with its evidence of layers of Sydney's settled history. Knitters sometimes complain about the lack of appreciation when they give knitted gifts to friends or family. Despite my recent worries about the appropriateness of my red gift scarf, I think I'm really fortunate that my knitted gifts are usually accepted with pleasure, and sometimes are even sought. 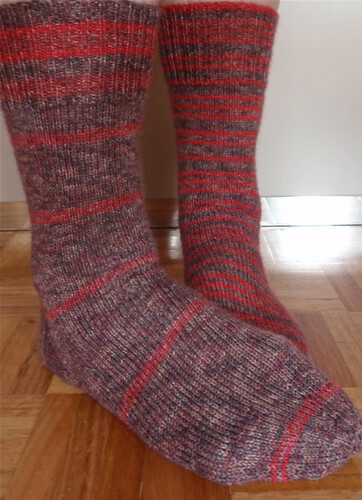 I've just finished some socks for a good friend. Barbara and I not only shared a workplace for quite a few years, but also discovered that we share many interests - including an interest in crafts and particularly textiles. So when she expressed an enthusiasm for my knitted socks I was only too delighted to have another appreciative recipient for my knitting. The socks are yet another Nancy Bush pattern from the best sock book ever, Knitting Vintage Socks. 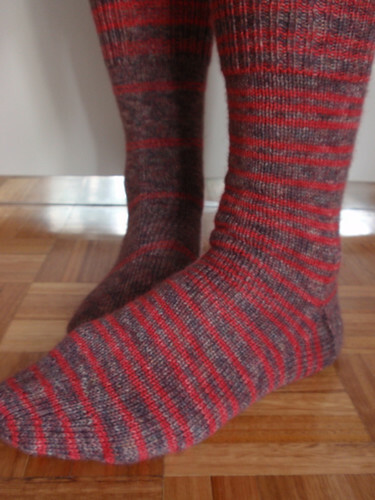 The particular pattern in 'Gentleman's Half Hose in Ringwood Pattern' and the main yarn is Knitabulous's Softsock in Foxymoron. The colour name always makes me smile. As the socks are quite long I was a bit worried I might run out of yarn and so knitted the toes in plain grey Patonyl yarn. 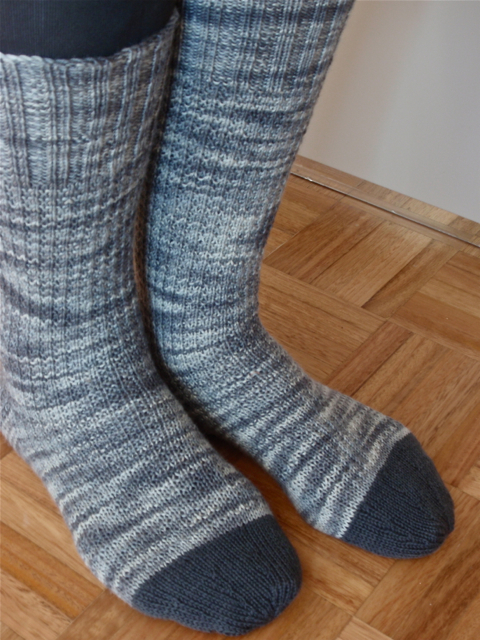 As it turned out, I probably would have had enough of the Foxymoron mottled grey yarn to complete the socks, but I find the plain toes very pleasing. Thoroughly pleasurable knitting. Great pattern, great yarn, and the great satisfaction of giving an appreciated gift. 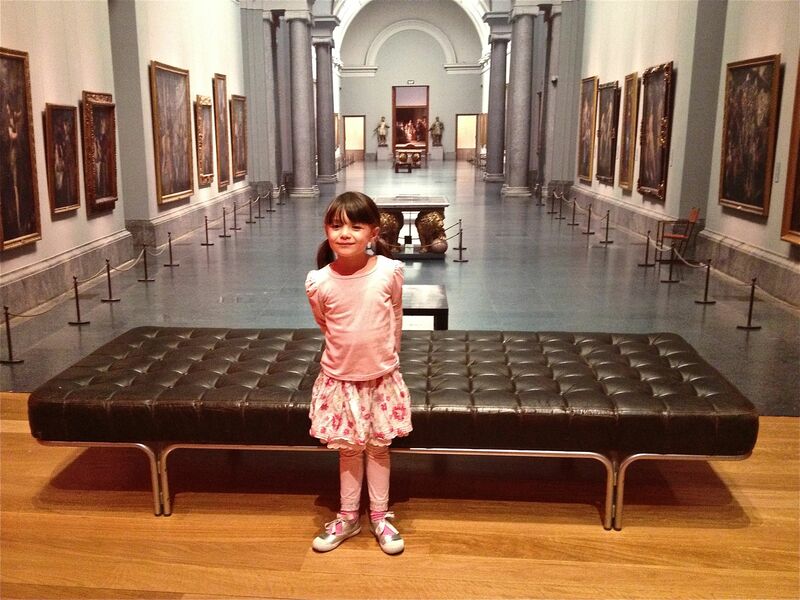 I've had several days in Brisbane visiting my daughter and grand-daughter. Brisbane lived up to its 'beautiful one day, perfect the next' reputation. Bright blue skies, cool nights, too early in Spring for the dreaded Brisbane humidity. There was a new exhibition to see at the wonderful Queensland Art Gallery - Portrait of Spain: Masterpieces from the Prado. This is an exhibition that's interesting, rather than engaging. Many of the paintings are drawn from the late sixteenth and seventeenth centuries - the period of Spain's European grandeur and are created to reflect and enhance that grandeur. There are very formal royal and court portraits, including masterpieces by Velasquez, that tell you so much about the nature of the monarchy and the absolutist rule in Spain at the time. There are religious and mythological works that tell you much about how the commisioners of the paintings viewed their world. I found the paintings interesting for what they told me about the world they represented, rather than as emotionally moving art works. I think these are works that (if you are fortunate enough) are best viewed in situ. The scale of the Prado museum - its immense collection, its maze of grand rooms and its kilometres of corridors adds to the grandeur of the works. So a fun part of this QAG exhibition is its entrance with a video installation recreating the foyer of the Prado, where the perspectives of the architecture change as you move your viewing position. I also liked a video installation by Spanish artist Francisco Jodice in which he has produced 480 video portraits of visitors to the Prado. This is a fascinating attempt to echo the portraits of the collection by portraying the clothing, hairstyles, jewellery and expressions of contemporary viewers. 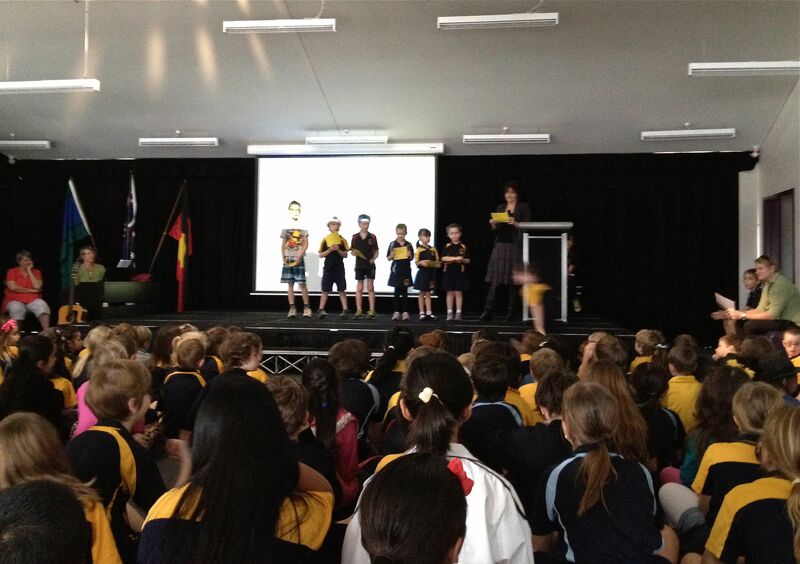 I walked my grand-daughter to school and attended her school assembly. She not only was chosen to help distribute the merit awards for the week, but she also received a gold-starred certificate herself, for 'being a great friend'. I see so much to like in public schools such as the one my grand-daughter attends. I like the values they so openly encourage and espouse - sharing, inclusion, community, respect, perseverance. I like the way children with disabilities are integrated within the school. I like the fact that the Principal knows all the children by name. I like the way parents, grandparents and siblings feel welcome at the school. I like the diversity of cultural backgrounds. There's much discussion in Australia at present about the need for good teacher quality, which I think is an important and relevant discussion. But I hope that any discussion of teacher quality continues to emphasise the desirability of developing the values so evident in my grand-daughter's school. I spent my birthday in Brisbane and had a perfect birthday lunch with my daughter. 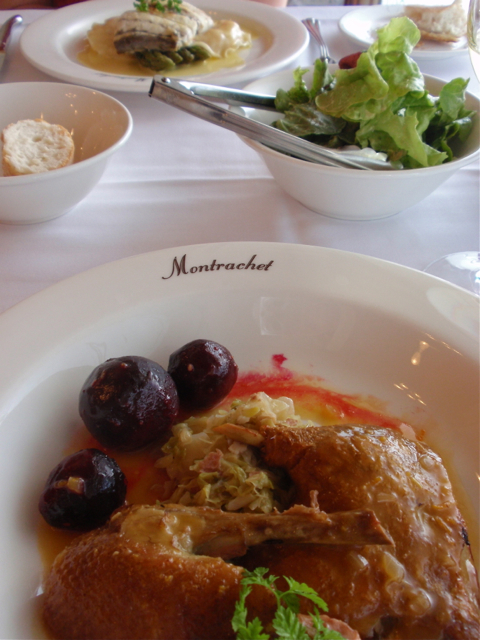 We went to Montrachet, a very traditional French restaurant. Sometimes in our search for the new and different in food we overlook the pleasures of tried and tested food combinations, perfectly cooked. This was a totally satisfactory lunch. 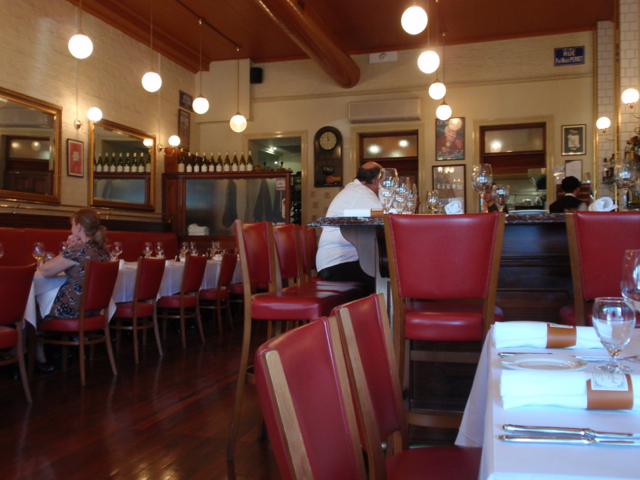 Loved the decor, the food, and the unobtrusive but so competent service. I've kind of taken my eye off my book-buying. At one level the attempt to limit my book-buying to 12 books for 2012 has been an abject failure. But there's a sliver of silver lining in that I do now think more before I purchase a book, and there have been a number of occasions on which I've actively resisted the urge to buy. July was fine. I bought only one book - Mo Hayder's sensationalist and morally questionable Birdman when I wanted something distracting to read. August has been a buying disaster. I blame the Byron Bay Writer's Festival. I've already noted how impressed I was by Australian novelist Alex Miller's interview at the Festival - so I felt I needed to buy his latest book, Autumn Laing which I've still to read. Text Classics (a venture by Text Publishing to re-publish out-of-print Australian 'classics' at wonderfully cheap prices) has included some crime fiction which tempted me. I discovered I hadn't read Peter Temple's An Iron Rose (1998) and of course couldn't resist buying it. I am a Peter Temple fan. His early books are well-plotted, well-written and deeply Australian, but his most recent novel, Truth, is an example of how an alleged 'crime novel' can transcend its genre. I laughed out loud with Shane Maloney's Stiff. There were others - but I won't bore you with a full disclosure of my temptations and falls. Prolific Singaporean writer Shamini Flint was one of the Festival's great entertainments. The friend with whom I was staying already had one of her books featuring Inspector Singh of the Singapore police. I galloped through it. Fun, fun, fun, and along the way interesting and challenging insights into various south-east Asian cultures and cultural stereotypes. I've subsequently bought another two of the series in e-book format and have devoured them, too. And then there's book group reading; in particular, Irish-born, now Canadian, Emma Donoghue's Room. I'm sure I've already written somewhere that I have a very low tolerance level for whimsy, which leads me to be suspicious of novels or even films that are voiced by children or (heaven forbid!) animals. So I was not predisposed to like Room, whose narrator is five-year-old Jack, imprisoned in an impregnable shed with his kidnapped mother for his whole life. This is an interesting contribution to the genre of novels that teases out how we learn about our world by focusing on people whose initial socialisation has been stunted or severely limited. This novel is not whimsical. And despite the horror of the situation it depicts, it's essentially a story of the capacity for survival through caring relationships. So, disaster on the book-buying front. I haven't even totalled the number of books I've bought in August because it's just too many. And I've already bought one book for September!